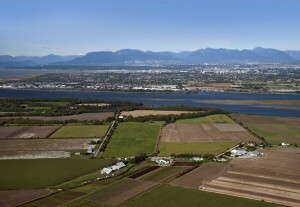 The Lower Mainland-Southwest region is nestled between the mountains, the coast, the area along the British Columbia and Washington state border, where the rich and fertile Fraser Valley farming region lies. Here, family farms and amazing roadside stands sell fresh, mouth-watering produce — showing off the region’s bounty along rolling farmland. The climate, featuring the fewest frost days and highest rainfall of all the regions, is perfectly suited for vegetables and berries. And, while technically BC’s smallest region, it more than makes up for its size with over 5,400 farms producing over 65% of the province’s agricultural output*. This region produces over 70% of BC’s dairy products, berries, vegetables (like potatoes), poultry, eggs, pork, greenhouse vegetables, mushrooms, floriculture, and nursery products. The possibilities for Vancouver’s vibrant foodie and restaurant scene doesn’t end there, as poultry, seafood, and cattle all feature prominently in the farms surrounding the big city — feeding over 60% of the province’s people*. 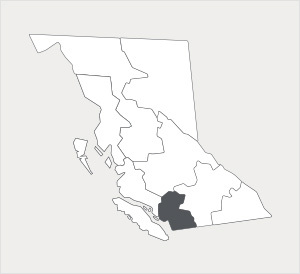 Lower Mainland-Southwest also features the lion’s share of greenhouses in the province. Growing mainly tomatoes, cucumbers, and peppers, greenhouses are part of the province’s 5.5 million square meters of greenhouse space*** — that’s the equivalent of over 650 World Cup Soccer fields. *Source: Agriculture in the Classroom, Canada. “A Guide to BC Agriculture Resources”. Pg. 15.